HUNTSVILLE, Texas – In their first true road game of the season, the Bears battled the Sam Houston State Bearkats in a back-and-forth contest, but ultimately fell 8-7 Tuesday night at Don Sanders Stadium in Huntsville. Baylor (13-6) scored a run in the top of the first inning without the benefit of a hit as two walks, a sacrifice bunt and a couple of SHSU errors manufactured a run for the Bears. The Bearkats (13-5) pulled ahead 4-1 after plating four runs in the third inning, but the Bears answered back in the fourth after beginning the inning with three consecutive walks before Josh Bissonette bounced into a run-scoring 6-4-3 double play. Ryan Bertelsman followed with a pinch-hit bloop single that chased in Davion Downey and brought Baylor within a run. Richard Cunningham blasted a solo shot in the top of the fifth, his second homer of the year, to tie the score at 4-4. The score would stay tied as Baylor reliever Jacob Ashkinos tossed a season-high three innings without allowing a run. He struck out the side in the bottom of the fifth, part of his four-punchout outing, another season-high. The Bearkats edged in front in the bottom of the seventh due to some unlucky breaks for the Bears. An apparent double play was in order, but a throw from Andy Thomas to second base bounced off the runner’s shoulder and into the outfield, allowing SHSU to score the first of their three runs in the inning to go up 7-4. But once again, Baylor countered in the top of the eighth as Thomas singled to right field and subsequently scored on a Shea Langeliers triple that was laced to the deepest part of the park in straightaway center field. Downey then drove home Langeliers with a sacrifice fly to left that made it 7-6. Cole Haring restarted the rally with an infield single, went on to steal second and then advanced to third base on a wild pitch. A two-out single by Nick Loftin tied the ballgame at 7-7, but that was all the Bears would get as they stranded two runners on base to end the inning. The Bearkats landed the final punch in the bottom of the eighth with a triple by Gavin Johnson and an RBI groundout by Reese Johnson to go ahead 8-7. In the bottom of the ninth, Langeliers ignited a bid for a two-out rally with a double down the third base line. After Downey was intentionally walked, Haring grounded out to third base for the final out. *Baylor still leads the all-time series against Sam Houston State 64-47, but the Bears are now 3-4 against the Bearkats under head coach Steve Rodriguez. This was Baylor’s first loss at SHSU in the Rodriguez era. *This was the first meeting between Baylor and SHSU since April 10, 2018, a 12-inning game in which the Bears outlasted the Bearkats 4-2 in Huntsville, a game that propelled the Bears to wins in 15 of their next 16 games last season. *This was Baylor’s first true road game of the season. The Bears will play five games at home before traveling to Kansas for their next road game on March 29 against the Jayhawks. *The Bears are 29-11 in midweek games under Rodriguez, 2-1 in midweek matchups in 2019. *The Bears have recorded an extra base hit in 18 of 19 games this season. 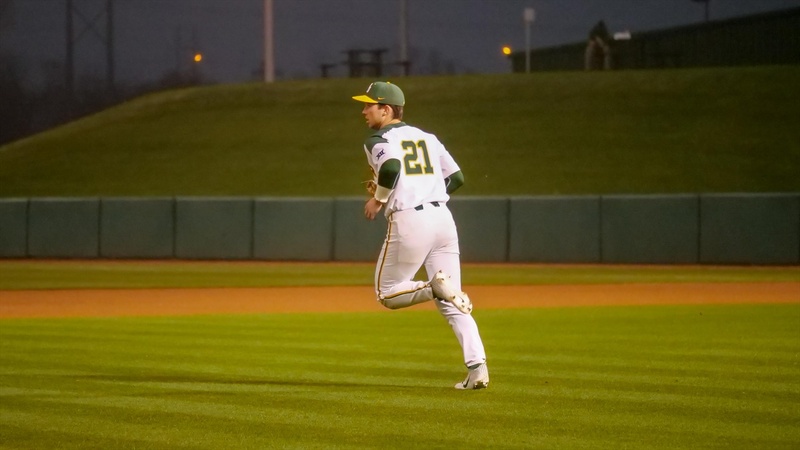 *Baylor has stolen 24 bases this season on 29 attempts as Ryan Bertelsman nabbed his second bag of the year in the fourth inning and Cole Haring stole his fourth base of the season in the eighth. The Bears were 34-for-51 when trying to steal in 2018. *Since inserting Nick Loftin in the leadoff spot, the Bears have scored 41 runs on 64 hits in their last six games. Loftin is 7-for-23 with 3 HR, 4 RBI and 5 runs scored during the stretch. The Bears are 4-2 in such games. *Richard Cunningham hit his second home run of the season, 21st of his career, to extend his on-base streak to seven games. *Davion Downey extended his on-base streak to seven games. *Andy Thomas has a hit streak of six games. *Bertelsman extended his on-base streak to five games. *Thomas made his first start of the season at first base. *Shea Langeliers laced a triple in the eighth inning, his first of the season. He has recorded two triples in each of his previous two seasons. *Luke Boyd made his second start of the season and third of his career, going two scoreless innings and allowing just one hit and one walk. It was his first appearance of the season without recording a strikeout. *Jacob Ashkinos made his sixth relief appearance of the year, recording a season-high three innings pitched and four strikeouts. *Ryan Leckich made his team-leading 10th appearance on the mound. 5 – Shea Langeliers reached base in all five of his plate appearances. He reached on an error, was hit-by-a-pitch, walked, and recorded two hits, a double and a triple. The Bears will open Big 12 conference play this weekend as West Virginia travels down to Waco for a three-game series. Game 1 will be Friday at 6:35 p.m. and the first 1,000 fans receive a replica 2018 Big 12 Tournament Championship ring.